Last December I went a little nuts with backyard bird watching (well, in my case it was the front yard). I had read the book, The Urban Bestiary, and dove head first into paying more attention to the neighborhood critters and appreciating them more than just flying "little brown jobs". I would spend at least 15 minutes in the morning before work meditating and staring out the front window, watching all the bird action with the multiple feeders I put out. I'm sure the passers-by in our neighborhood thought I was nuts and, every Wednesday, the garbage man waved at me as he did his rounds. It got so embarrassing that when I heard his truck I would throw myself to the floor below the windowsill so he wouldn't see me sitting there, staring out the window like an old lady waiting to yell at the neighbor kids. Anyway, over the intervening months I have alternated between different types of birdseed, but I used quite a bit of black oiled sunflower seeds right around the time we put down a bunch of mulch in the front yard. The sunflower seeds were quite a mess because of all the shells but, lo and behold, a few weeks after mulching, we noticed a bunch of little plants growing underneath the feeder. I was going to pull the little plants up because they looked like weeds, but my husband insisted that we keep them. And, I'm glad we did. 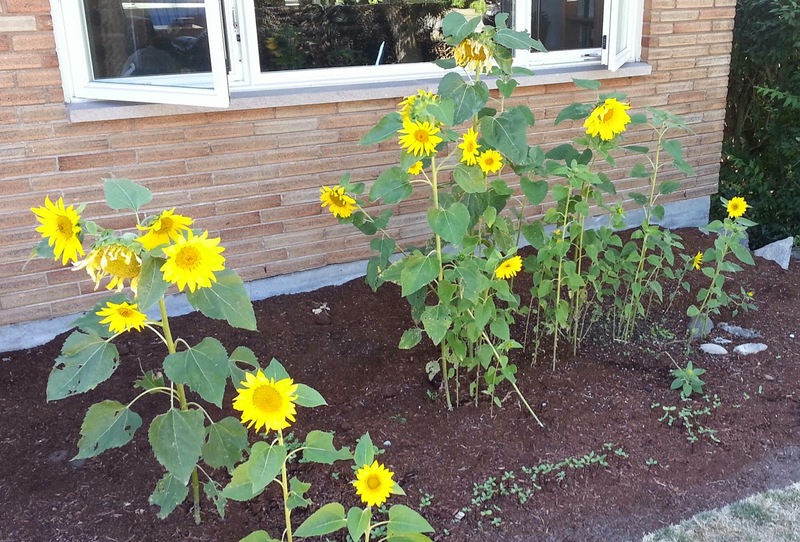 Because now we have an amazing sunflower garden growing by the front window. A lot of people comment on the sunflowers and are interested to learn how they got there. Nothing like a little free work by my birdy friends. The nice thing about this little experiment is that when the seed heads are ready, the birds get to eat the fruits of their labor. I added back the sunflower seeds to the bird feeder recently so we'll hopefully have another round for fall. Have you had bird feeders "accidentally" or on purpose seed a flower patch for you? Were they sunflowers or something else? In my last garden, the birds planted hemp. I'm assuming it was oil hemp rather than a more interesting variety, but we did pull them out when we put the house on the market! There were a couple other things growing from a seed mix that I did pull up. They did look hempy, now that you mention it. The only success I've ever had with growing sunflowers is the ones the birds plant for me! Lazy gardening is the best kind. @Lizzie - I know! Me too. I've tried planting sunflowers for several years now and I got nothing. This year, I spent zero effort and look what happens.